Never know what to get the person who has "everything"? 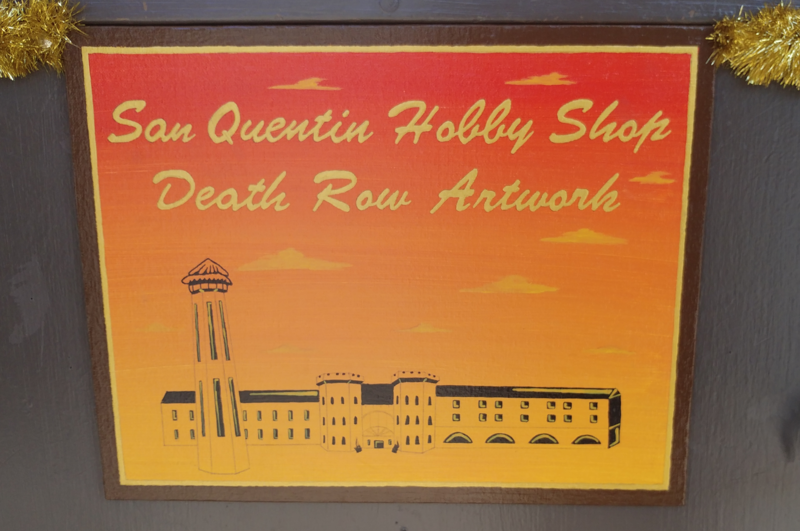 It's pretty unlikely they'll have anything crafted by death row inmates, and that's where San Quentin State Prison's Handicraft Shop (aka the Hobby Shop) comes in. This unusual Marin County, California store is located right outside the penitentiary's gate and offers a wide assortment of prisoner-made artwork and crafts. That is, if you can get in. No, you don't have to go through security or be related to an inmate or anything like that to shop there. It just always seems to be closed, despite the posted hours. I first heard about the shop in the late 1990s and tried several times, unsuccessfully, to get in. Then, on one late December day some 11 years ago, I caught the attention of the then-new director of the prison's art program as he was closing up shop. He said couldn't let me in that day but promised if I emailed him, he'd get me in soon. Game on. On Christmas Eve day in 2007, myself and two friends got access. At the time, I didn't have the money to buy the bigger art (some of which was painted on the back of blue-and-white-striped mattress ticking). Instead, I bought a couple of inexpensive "Jailhouse Rocks," one for myself and one to use as a Yankee Swap gift I was attending that night. From what I gather, inmates can buy kits inexpensively that they can assemble and then sell for a small profit. The kits for the "Jailhouse Rocks" need actual stones from the prison's yard to complete which I found oddly charming. There were all kinds of handmade items in the shop, anything from knit and crocheted blankets (I inquired about a baby one inside a glass display case and was told a serial killer knit it) to sketches to the aforementioned kit crafts. I was told that the really good art, primarily paintings, never make it to the shop's floor. They get sent directly to dealers who have commissioned them for collectors. I was also told that the inmates, including convicted murderer Scott Peterson, make their shop offerings in their cells as part of the handicraft program. I haven't been back in years but I did drop by recently to show a pal. Once again it wasn't open, so I just took some photos by pressing my camera to the shop's windows. Hours below. Bring cash, your credit/debit cards are no good here! Good luck escaping from this one.